Trx suspension training is great for women and men. One of the best trx oblique exercises is side planks with your feet in the trx system. If you want to seriously work your obliques, trx side planks will definitely deliver a burn that you'll feel for days. Because the trx is very unstable your oblique and lower back muscles will have to work overtime to keep your body stable. If you're a beginner you should build up with regular side planks on the floor or bosu ball side planks. 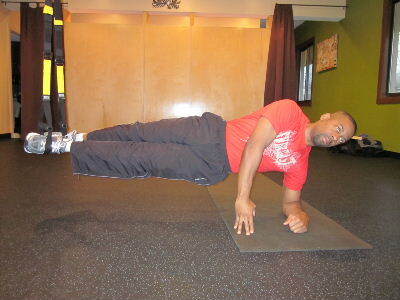 Once you have a good base of strength then try more advanced exercises like the trx side plank. Okay, below, you can see pictures and read a little more about this exercise. Starting position: Simply start by securing your feet in the trx straps. After securing your feet, place your elbow on a mat and keep your elbow right underneath your shoulder, and place your opposite hand on your hip. Form: Exhale and lift your body so that your body is parallel to the floor. Hold this position for 10-60 seconds, and repeat 2-3 times on each side. Easier Variation: If you need a little extra support you can place your top hand gently on the floor to steady yourself. 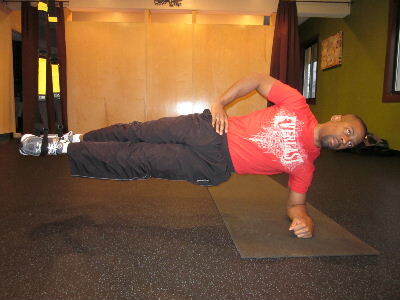 The moving side plank is one of the toughest trx oblique exercises. 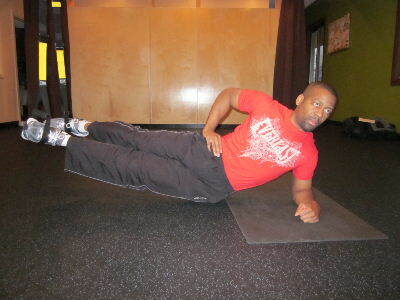 Once you master the static side plank, you can really challenge your obliques with the moving side plank. The starting position is exactly the same, except during the moving side plank you lower your hip to the ground and then raise back up to the starting position. Personal Trainer Tips: This exercise takes some time to get used to. The toughest part is learning to secure your feet in the straps so that you can focus on the obliques. Start with the easier variations and build up your strength. Perform 5-15 repetitions at a time and do 1-3 sets on each side. Exercises that work the obliques also challenge the lower back, so always listen to your body and build up the volume slowly over time. If you don't have access to a trx try some other oblique exercises. The Trx system is a fun and challenging tool to work your core and your entire body, and the cool thing is that you can set it up in your home with the door stop or take it out to the park for an outdoor workout. If you gym has a trx great, but you don't always need a gym to get a great workout. To get your Own TRX click below!